We changed this page link, please visit http://www.welaughwecrywecook.com/TheBook. Do you have the name of a good book, to begin with on starting to be “Vegan”? 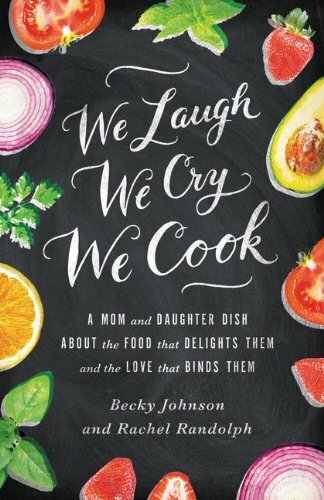 Priscilla, We Laugh, We Cry, We Cook, has a great section on how Rachel became a vegan, what it means, why and how she makes it work. I honestly think it would be a good place to start. Hi Priscilla, I’d also recommend The Engine 2 Diet, especially if you are interested in making the change for health reasons. It has plans for slowly progressing to a vegan diet and for going “cold turkey.” If you are interested in becoming vegan for both diet and animal rights reasons and would like something to help push you in that direction, then as much as I hate to recommend this book because of some of the language, the Skinny B books are highly motivating for becoming vegan. Sorry I’m so late in responding to this. I hope you’ve found the kind of encouragement you needed. Best wishes to you.